There is a wonderful essay in the November 2002 edition of Smithsonian magazine describing Tim Hensley’s quest for Reasor Green, an old-timey apple once raised and sold by his great-great-grandfather, C.C. Davis, at his nursery in Lee County, Virginia in 1886. The tree was thought to be lost, but as fortune would have it, Tim was able to obtain cuttings from a surviving tree through the help of Mr. “Hop” Slemp of Dryden, Virginia. The full story is online at http://www.smithsonianmag.com/science-nature/apples.html. Tim, of Bristol, Virginia, was kind enough to share cuttings with us several years ago, so we are fortunate to now have this wonderful old apple in our collection. 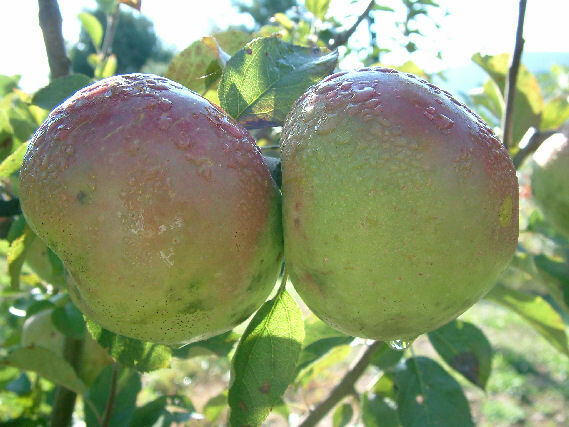 Fruit is medium to large in size, roundish ovate with green skin that has a distinctive faint scarlet blush. The crisp, firm flesh is subacid with a very fine flavor. It has the peculiar habit of drying when slightly wounded instead of rotting. Ripens late fall and is an excellent keeper.